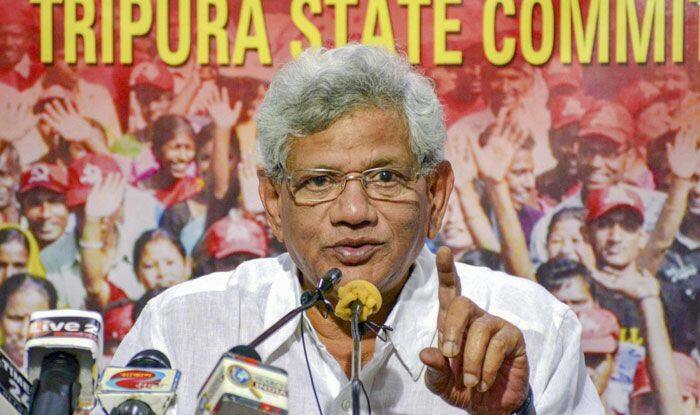 CPI-M General Secretary Sitaram Yechury said BJP workers and BJP-sponsored criminals rigged more than 464 of the 1,679 polling stations across the constituency. The Congress and the CPI-M have alleged poll malpractices by the Bharatiya Janata Party (BJP) government at the Centre and in Tripura during the voting for the Tripura West Lok Sabha seat on Thursday. But the BJP rejected the charges saying “opposition parties are making false allegations to cover up their defeats”. Yechury said the BJP workers and their hooligans drove Left parties’ polling agents out from several hundred polling stations and prevented thousands of opposition supporters from casting votes. He said a party delegation met the Election Commission (EC) in Delhi and submitted a memorandum detailing vote-rigging by the BJP supporters and their hoodlums. “We would submit more details of poll violence to the EC and demand repolling in those booths to give thousands of voters a chance to cast their votes,” said Yechury. Former Chief Minister and CPI-M politburo member Manik Sarkar, after casting his vote said this election was “to save the country from the atrocities and utter misrule of the Narendra Modi-led government at the Centre”. “The BJP is afraid of facing free and fair elections in Tripura,” he said. He alleged the BJP members and their hoodlums, locally called “bike bahini” (two-wheeler group), since Tuesday visited houses of thousands of opposition supporters and CPI-M members and told them not to venture out to vote. Rejecting the allegations, BJP spokesman Nabendu Bhattacharjee said the opposition parties, especially the CPI-M, like last year’s Assembly elections, were foreseeing defeat in the Lok Sabha polls, were making fake, concocted and imaginary allegations.